NetBSD is a free and open-source Unix-like operating system based on the Berkeley Software Distribution (BSD), a Research Unix derivative developed at the University of California, Berkeley. It was the first open-source BSD descendant officially released after 386BSD was forked. It continues to be actively developed and is available for many platforms, including servers, desktops, handheld devices, and embedded systems. The NetBSD project focuses on code clarity, careful design, and portability across many computer architectures. Its source code is publicly available and permissively licensed. NetBSD was originally derived from the 4.3BSD-Reno release of the Berkeley Software Distribution from the Computer Systems Research Group of the University of California, Berkeley, via their Net/2 source code release and the 386BSD project. 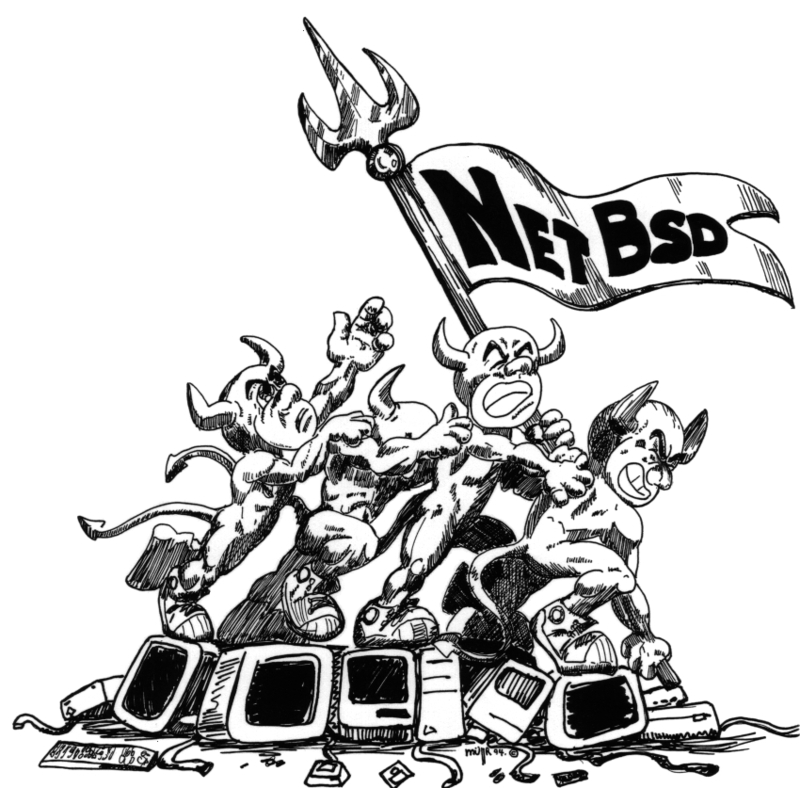 The NetBSD project began as a result of frustration within the 386BSD developer community with the pace and direction of the operating system's development. The four founders of the NetBSD project, Chris Demetriou, Theo de Raadt, Adam Glass, and Charles Hannum, felt that a more open development model would benefit the project: one centered on portable, clean, correct code. They aimed to produce a unified, multi-platform, production-quality, BSD-based operating system. The name "NetBSD" was suggested by De Raadt, based on the importance and growth of networks such as the Internet at that time, and the distributed, collaborative nature of its development. The NetBSD source code repository was established on 21 March 1993 and the first official release, NetBSD 0.8, was made in April, 1993. This was derived from 386BSD 0.1 plus the version 0.2.2 unofficial patchkit, with several programs from the Net/2 release missing from 386BSD re-integrated, and various other improvements. The first multi-platform release, NetBSD 1.0, was made in October 1994, and being updated with 4.4BSD-Lite sources, it was free of all legally encumbered 4.3BSD Net/2 code. Also in 1994, for disputed reasons, one of the founders, Theo de Raadt, was removed from the project. He later founded a new project, OpenBSD, from a forked version of NetBSD 1.0 near the end of 1995. In 1998, NetBSD 1.3 introduced the pkgsrc packages collection. Until 2004, NetBSD 1.x releases were made at roughly annual intervals, with minor "patch" releases in between. From release 2.0 onwards, NetBSD uses semantic versioning, and each major NetBSD release corresponds to an incremented major version number, i.e. the major releases following 2.0 are 3.0, 4.0 and so on. The previous minor releases are now divided into two categories: x.y "stable" maintenance releases and x.y.z releases containing only security and critical fixes. As the project's motto ("Of course it runs NetBSD" ) suggests, NetBSD has been ported to a large number of 32- and 64-bit architectures. These range from VAX minicomputers to Pocket PC PDAs. As of 2009, NetBSD supports 57 hardware platforms (across 15 different instruction sets). The kernel and userland for these platforms are all built from a central unified source-code tree managed by CVS. Currently, unlike other kernels such as μClinux, the NetBSD kernel requires the presence of an MMU in any given target architecture. NetBSD's portability is aided by the use of hardware abstraction layer interfaces for low-level hardware access such as bus input/output or DMA. Using this portability layer, device drivers can be split into "machine-independent" and "machine-dependent" components. This makes a single driver easily usable on several platforms by hiding hardware access details, and reduces the work to port it to a new system. This permits a particular device driver for a PCI card to work without modifications, whether it is in a PCI slot on an IA-32, Alpha, PowerPC, SPARC, or other architecture with a PCI bus. Also, a single driver for a specific device can operate via several different buses, like ISA, PCI, or PC Card. In comparison, Linux device driver code often must be reworked for each new architecture. As a consequence, in porting efforts by NetBSD and Linux developers, NetBSD has taken much less time to port to new hardware. This platform independence aids the development of embedded systems, particularly since NetBSD 1.6, when the entire toolchain of compilers, assemblers, linkers, and other tools fully support cross-compiling. In 2005, as a demonstration of NetBSD's portability and suitability for embedded applications, Technologic Systems, a vendor of embedded systems hardware, designed and demonstrated a NetBSD-powered kitchen toaster. Commercial ports to embedded platforms, including the AMD Geode LX800, Freescale PowerQUICC processors, Marvell Orion, AMCC 405 family of PowerPC processors, Intel XScale IOP and IXP series, were available from and supported by Wasabi Systems. The NetBSD cross-compiling framework (also known as "build.sh") lets a developer build a complete NetBSD system for an architecture from a more powerful system of different architecture (cross-compiling), including on a different operating system (the framework supports most POSIX-compliant systems). Several embedded systems using NetBSD have required no additional software development other than toolchain and target rehost. NetBSD features pkgsrc (short for "package source"), a framework for building and managing third-party application software packages. The pkgsrc collection consists of more than 18,000 packages as of April 2018. Building and installing packages such as KDE, GNOME, the Apache HTTP Server or Perl is performed through the use of a system of makefiles. This can automatically fetch the source code, unpack, patch, configure, build and install the package such that it can be removed again later. An alternative to compiling from source is to use a precompiled binary package. In either case, any prerequisites/dependencies will be installed automatically by the package system, without need for manual intervention. pkgsrc supports not only NetBSD, but also several other BSD variants like FreeBSD and Darwin/Mac OS X, and other Unix-like operating systems such as Linux, Solaris, IRIX, and others, as well as Interix. pkgsrc was previously adopted as the official package management system for DragonFly BSD. NetBSD has supported SMP since the NetBSD 2.0 release in 2004, which was initially implemented using the giant lock approach. During the development cycle of the NetBSD 5 release, major work was done to improve SMP support; most of the kernel subsystems were modified to be MP safe and use the fine-grained locking approach. New synchronization primitives were implemented and scheduler activations was replaced with a 1:1 threading model in February 2007. A scalable M2 thread scheduler was implemented, though the old 4.4BSD scheduler still remains the default but was modified to scale with SMP. Threaded software interrupts were implemented to improve synchronization. The virtual memory system, memory allocator and trap handling were made MP safe. The file system framework, including the VFS and major file systems were modified to be MP safe. Since April, 2008 the only subsystems running with a giant lock are the network protocols and most device drivers. NetBSD provides various features in the security area. The Kernel Authorization framework (or Kauth) is a subsystem managing all authorization requests inside the kernel, and used as system-wide security policy. It allows external modules to plug-in the authorization process. NetBSD also incorporates exploit mitigation features, ASLR , KASLR, restricted mprotect() and Segvguard from the PaX project, and GCC Stack Smashing Protection (SSP, or also known as ProPolice, enabled by default since NetBSD 6.0) compiler extensions. Verified Executables (or Veriexec) is an in-kernel file integrity subsystem in NetBSD. It allows the user to set digital fingerprints (hashes) of files, and take a number of different actions if files do not match their fingerprints. For example, one can allow Perl to run only scripts that match their fingerprints. The cryptographic device driver (CGD) allows using disks or partitions (including CDs and DVDs) for encrypted storage. The Xen virtual-machine monitor has been supported in NetBSD since release 3.0. The use of Xen requires a special pre-kernel boot environment that loads a Xen-specialized kernel as the "host OS" (Dom0). Any number of "guest OSes" (DomU) virtualized computers, with or without specific Xen/DomU support, can be run in parallel with the appropriate hardware resources. The need for a third-party boot manager, such as GRUB, was eliminated with NetBSD 5's Xen-compatible boot manager. NetBSD 6 as a Dom0 has been benchmarked comparably to Linux, with better performance than Linux in some tests. NetBSD 5.0 introduced the rump kernel, an architecture to run drivers in user-space by emulating kernel-space calls. This anykernel architecture allows adding support of NetBSD drivers to other kernel architectures, ranging from exokernels to monolithic kernels. NetBSD includes many enterprise features like iSCSI, a journaling filesystem, logical volume management and the ZFS filesystem. The WAPBL journaling filesystem, an extension of the BSD FFS filesystem, was contributed by Wasabi Systems in 2008. The NetBSD Logical Volume Manager is based on a BSD reimplementation of a device-mapper driver and a port of the Linux Logical Volume Manager tools. It was mostly written during the Google Summer of Code 2008. The ZFS filesystem developed by Sun Microsystems was imported into the NetBSD base system in 2009. Currently, the NetBSD ZFS port is based on ZFS version 22. The CHFS Flash memory filesystem was imported into NetBSD in November 2011. CHFS is a file system developed at the Department of Software Engineering, University of Szeged, Hungary, and is the first open source Flash-specific file system written for NetBSD. At the source code level, NetBSD is very nearly entirely compliant with POSIX.1 (IEEE 1003.1-1990) standard and mostly compliant with POSIX.2 (IEEE 1003.2-1992). NetBSD provides system call-level binary compatibility on the appropriate processor architectures with its previous releases, but also with several other UNIX-derived and UNIX-like operating systems, including illumos/Solaris, Linux, other BSD variants like FreeBSD and SunOS 4. This allows NetBSD users to run many applications that are only distributed in binary form for other operating systems, usually with no significant loss of performance. A variety of "foreign" disk filesystem formats are also supported in NetBSD, including FAT, NTFS, Linux ext2fs, OS X UFS, RISC OS FileCore/ADFS, AmigaOS Fast File System, IRIX EFS and many more through FUSE. Kernel-space scripting with the Lua programming language is a relatively new feature in NetBSD; it is available as of NetBSD 7.0. The Lua language (i.e., its interpreter and standard libraries) was initially ported to the NetBSD kernel during Google Summer of Code 2010 and has undergone several improvements since then. There are two main differences between user and kernel space Lua: kernel Lua does not support floating-point numbers; as such, only Lua integers are available. It also does not have full support to user space libraries that rely on the operating system (e.g., io and os). On 20 June 2008, the NetBSD Foundation announced a transition to the two clause BSD license, citing concerns with UCB support of clause 3 and industry applicability of clause 4. NetBSD also includes the GNU development tools and other packages, which are covered by the GPL and other open source licenses. As with other BSD projects, NetBSD separates those in its base source tree to make it easier to remove code that is under more restrictive licenses. As for packages, the installed software licenses may be controlled by modifying the list of allowed licenses in the pkgsrc configuration file (mk.conf). The following table lists major NetBSD releases and their notable features in reverse chronological order. Minor and patch releases are not included. Added USB 3 support, audio mixer on kernel, Meltdown and Spectre vulnerability mitigation, ASLR enabled by default, hardened memory layout (with W^X support for more CPU models), UEFI boot, new drivers and other updates. From NetBSD 8.0, teeny branches will no longer be. Improvements in the Linux emulation subsystem. Compatibility binary fixes for old NetBSD executables. Support for Raspberry Pi 3. Fixes of setup interruption on Hyper-V VMs with Legacy Network Adapter. Initial DRM/KMS support for NVIDIA graphics cards via nouveau (Disabled by default). Improvements to wm driver such as C2000 KX and 2.5G support, Wake On Lan support, 82575 and newer SERDES based systems now work. Add accelerated support for modern Intel and Radeon devices on x86 through a port of the Linux 3.15 DRM/KMS code. blacklistd, a daemon that integrates with packet filters to dynamically protect network daemons from network break-in attempts. NPF improvements such as JIT compilation and dynamic rules. Add support for Lemote Yeeloong Notebooks. support for the Multiprotocol Label Switching protocol. To address the year 2038 problem, time t was extended to 64-bit type on all NetBSD ports. Rewritten threading subsystem based on a 1:1 model and rewritten scheduler implementation. Rewritten Loadable kernel module framework, which will replace old LKMs. Use of X.Org rather than XFree86 by default for i386 and amd64 ports, and introduction of drm(4)/DRI for 3D hardware acceleration. Preliminary support for using Clang instead of GCC as the system compiler. Added support for ASLR in the kernel and dynamic linker. Added support for slab allocator, iSCSI target, CARP, tmpfs, Explicit Congestion Notification, Xen 3, the Kernel Authorization framework, Veriexec and other security extensions, and a Bluetooth protocol suite. Support for filesystems > 2 terabytes added. OpenBSD Packet Filter was integrated as an alternative to IPFilter. Addition of native POSIX threads and SMP support on i386 and other platforms. Support for UFS2 and SMBFS, addition of kqueue. Unified Buffer Cache (UBC) was introduced, which unifies the filesystem and virtual memory caches of file data. Zero-copy support for TCP and UDP transmit path. New implementation of cross-building (build.sh) infrastructure. Added support for multibyte LC_CTYPE locales. IPv6 and IPsec were added to the network stack. New implementation of rc.d system start-up mechanism. Start of migration to ELF-format binaries. A ktruss utility for kernel tracing was added. Six new platforms supported, including sparc64. Added FFS soft updates and support for NTFS. UVM, a rewritten virtual memory subsystem, was introduced. Added RAIDframe, a software RAID implementation, and imported IPFilter. Completion of the integration of all remaining 4.4BSD Lite-2 kernel improvements. Ports to Power Macintosh and NeXTcube/station systems added. XFree86 source tree was made a supported part of the distribution. Support for ISA Plug and Play, PCMCIA, ATAPI and APM added. ext2fs and FAT32 filesystems added. The pkgsrc packages collection system was introduced. Support for NFSv3, SCSI scanner and medium changer devices added. NTP phase-locked loop added in kernel. Ports for ARM and Sharp X68k systems added. Ports for DEC Alpha, Atari TT/Falcon030 and MVME68k systems added. The first multi-platform release, supporting the PC, HP 9000 Series 300, Amiga, 68k Macintosh, Sun-4c series and the PC532. The legally encumbered Net/2-derived source code was replaced with equivalent code from 4.4BSD-lite, in accordance with the USL v BSDi lawsuit settlement. Addition of shared libraries and Kerberos 5. Contained many enhancements and bug fixes. This was still a PC-platform-only release, although by this time, work was underway to add support for other architectures. Support for loadable kernel modules (LKM). The first official release, derived from 386BSD 0.1 plus the version 0.2.2 unofficial patchkit, with several programs from the Net/2 release missing from 386BSD re-integrated, and various other improvements. The NetBSD "flag" logo, designed by Grant Bissett, was introduced in 2004 and is an abstraction of their older logo, designed by Shawn Mueller in 1994. Mueller's version was based on the famous World War II photograph Raising the Flag on Iwo Jima. The NetBSD Foundation is the legal entity that owns the intellectual property and trademarks associated with NetBSD, and on 22 January 2004, became a 501(c)3 tax-exempt non-profit organization. The members of the foundation are developers who have CVS commit access. The NetBSD Foundation has a Board of Directors, elected by the voting of members for two years. NetBSD was used in NASA's SAMS-II Project of measuring the microgravity environment on the International Space Station, and for investigations of TCP for use in satellite networks. NetBSD's clean design, high performance, scalability, and support for many architectures has led to its use in embedded devices and servers, especially in networking applications. A commercial real-time operating system, QNX, uses a network stack based on NetBSD code, and provides various drivers ported from NetBSD. Dell Force10 uses NetBSD as the underlying operating system that powers FTOS (the Force10 Operating System), which is used in high scalability switch/routers. Force10 also made a donation to the NetBSD Foundation in 2007 to help further research and the open development community. Wasabi Systems provides a commercial Wasabi Certified BSD product based on NetBSD with proprietary enterprise features and extensions, which are focused on embedded, server and storage applications. NetBSD was used in NASA's SAMS-II Project of measuring the microgravity environment on the International Space Station,and for investigations of TCP for use in satellite networks. In 2004, SUNET used NetBSD to set the Internet2 Land Speed Record. NetBSD was chosen "due to the scalability of the TCP code". NetBSD is also used in Apple's AirPort Extreme and Time Capsule products, instead of their own OS X (most of whose Unix-level userland code is derived from FreeBSD code but some is derived from NetBSD code). The operating system of the T-Mobile Sidekick LX 2009 smartphone is based on NetBSD. The Minix operating system uses a mostly NetBSD userland as well as its pkgsrc packages infrastructure since version 3.2. Parts of macOS were originally taken from NetBSD, such as the userspace command line tools. This was because they were already ported to PowerPC systems. Hosting for the project is provided primarily by Columbia University, and Western Washington University. Mirrors for the project are spread around the world and provided by volunteers and supporters of the project. ↑ "Twenty Years of Berkeley Unix: From AT&T-Owned to Freely Redistributable". Open Sources: Voices from the Open Source Revolution. O'Reilly Media. January 1999. ISBN 1-56592-582-3. 1 2 3 "About NetBSD". Retrieved 7 June 2014. NetBSD is a fork of the 386/BSD branch of the Berkeley Software Distribution (or BSD) operating system. ↑ "Get to know NetBSD: An operating system that travels". ibm.org. ↑ Ganssle, Jack G; Noergaard, Tammy; Eady, Fred; Edwards, Lewin; Katz, David J (14 September 2007). Embedded Hardware. ISBN 978-0-7506-8584-9. pp. 291–292. ↑ "NetBSD features list". The NetBSD Foundation, Inc. Retrieved 7 June 2014. NetBSD focuses on clean design and well architected solutions. ↑ Love, Robert (2005). "Chapter 19". Linux Kernel development (2. ed.). Sams Publishing. ISBN 0-672-32720-1. Retrieved 7 June 2014. Some examples of highly portable operating systems are Minix, NetBSD, and many research systems. ↑ "The History of the NetBSD Project". www.netbsd.org. The NetBSD Foundation. Retrieved 29 November 2009. 1 2 Chris G. Demetriou (19 April 1993). "So you say you want an interim release of 386bsd?". Newsgroup: comp.os.386bsd.announce. Usenet: 1qvpc9$1e8@agate.berkeley.edu. Retrieved 12 May 2010. ↑ "Information about NetBSD 0.8". ↑ "Information about NetBSD 1.0". ↑ De Raadt, Theo (29 March 2009). "Archive of the mail conversation leading to Theo de Raadt's departure". Retrieved 15 January 2010. ↑ "Platforms supported by pkgsrc". www.netbsd.org. The NetBSD Foundation. Retrieved 10 January 2010. ↑ "NetBSD release glossary and graphs". The NetBSD Project. 13 January 2010. Retrieved 15 January 2010. ↑ "Portability and supported hardware platforms". www.netbsd.org. The NetBSD Foundation. Retrieved 29 November 2009. 1 2 "BSD or Linux: Which Unix is better for embedded applications?" (PDF). Wasabi Systems Inc. 2003. Archived from the original (PDF) on 30 December 2006. Retrieved 11 June 2007. ↑ "Technologic Systems Designs NetBSD Controlled Toaster" (Press release). August 2005. Retrieved 11 June 2007. ↑ The NetBSD Foundation (10 January 2010). "Chapter 31. Crosscompiling NetBSD with build.sh". The NetBSD Guide. Retrieved 15 January 2010. ↑ Dillon, Matthew (31 August 2005). "PKGSRC will be officially supported as of the next release". DragonFly users List (Mailing list). Retrieved 15 January 2010. ↑ "NetBSD 2.0 release notes". ↑ "Significant changes from NetBSD 4.0 to 5.0". 23 December 2009. Retrieved 15 January 2010. ↑ "NetBSD security(8) manual page". ↑ "kauth(9)". NetBSD Manual Pages. 10 August 2009. Retrieved 15 January 2010. ↑ "NetBSD paxctl(8) manual page". ↑ "Chapter 19. NetBSD Veriexec subsystem". ↑ "Chapter 14. The cryptographic device driver (CGD)". ↑ "boot(8)". NetBSD Manual Pages. 4 September 2009. Retrieved 15 January 2010. ↑ Matthew, Cherry G.; Monné, Roger Pau (August 2012). "(Free and Net) BSD Xen Roadmap". Retrieved 29 December 2012. ↑ "The Anykernel and Rump Kernels". ↑ Burge, Simon (2 March 2008). "Patches for journalling support". tech-kern@NetBSD.org (Mailing list). Retrieved 15 January 2010. ↑ Hamsik, Adam (29 August 2008). "HEADS UP NetBSD lvm support". tech-kern@NetBSD.org (Mailing list). Retrieved 15 January 2010. ↑ "NetBSD Binary Emulation". 13 January 2010. Retrieved 15 January 2010. ↑ "Scriptable Operating Systems with Lua" (PDF). ↑ "NetBSD Licensing and Redistribution" (Press release). June 2008. Retrieved 20 June 2008. ↑ "Distro description". Licensing Section: Free Penguin. Retrieved 7 June 2014. NetBSD separates those in its base source tree, in order to make removal of code under more restrictive licenses easier. ↑ "Announcing NetBSD 8.0". NetBSD. 17 July 2017. ↑ "NetBSD 7.2 released (August 29, 2018)". www.netbsd.org. Retrieved 2018-09-04. 1 2 "Announcing NetBSD 5.0". ↑ Sonnenberger, Jörg (2012-01-19). "Status of NetBSD and LLVM". Retrieved 2015-03-26. ↑ "NetBSD 1.4 Release Announcement". ↑ "Information about NetBSD 1.3". ↑ "Information about NetBSD 1.2". ↑ "Information about NetBSD 1.1". ↑ "NetBSD 1.0 release announcement". ↑ "NetBSD 0.9 available for anon-ftp..."
↑ "Installation notes for NetBSD 0.8". ↑ "NetBSD logo design competition". ↑ The NetBSD Foundation, Inc.
↑ "NetBSD Developers". 7 January 2010. Retrieved 15 January 2010. 1 2 "Foundry27: Project Networking – Driver wiki page". QNX Software Systems. Retrieved 27 December 2011. ↑ "Third Party Open Source License Terms Guide". QNX Software Systems. Retrieved 27 December 2011. ↑ "Force10 Networks uses NetBSD to build software scalability into operating system". Dell (Press release). 13 February 2007. Archived from the original on 15 November 2011. Retrieved 27 December 2011. ↑ "Force10 Networks introduces unified operating system across product portfolio to lower total cost of owning and operating networks". Dell (Press release). 28 January 2008. Archived from the original on 15 November 2011. Retrieved 27 December 2011. ↑ "Wasabi Systems". Retrieved 16 February 2018. ↑ Duc, Hiep Nguyen (2016-06-21). "NetBSD Introduction by Siju Oommen George - BSD MAG". BSD MAG. Retrieved 2017-11-09. ↑ Rivett, Mary (12 April 1997). "Re: NetBSD/i386 and single board computers". port-i386 (Mailing list). ↑ Kruse, Hans; Allman, Mark; Griner, Jim & Tran, Diepchi (5 March 1998). "HTTP Page Transfer Rates over Geo-Stationary Satellite Links" (PDF). Archived from the original (PDF) on 20 July 2009. Retrieved 27 December 2011. ↑ Josefsson, Börje (14 April 2004). "SUNET Internet2 Land Speed Record: 69.073 Pbmps". SUNET. Retrieved 27 December 2011. ↑ "How to jailbreak an Apple Time Capsule?". superuser.com. Retrieved 27 December 2009. ↑ Fleishman, Glenn (16 February 2007). "AirPort Extreme: Apple Breaks 90 Mbps". wifinetnews.com. Retrieved 28 December 2009. ↑ "Myths about FreeBSD". Retrieved 7 June 2014. The two operating systems do share a lot of code, for example most userland utilities and the C library on OS X are derived from FreeBSD versions. ↑ "Overview of OS X". Apple Inc. 11 June 2012. ↑ "Sidekick LX 2009 / Blade Will Run NetBSD". www.hiptop3.com. 30 January 2009. Retrieved 5 February 2009. ↑ "Minix Gets a NetBSD Code Infusion". pcworld.com. 29 February 2012. Retrieved 4 July 2012. Negus, Christopher; Caen, Francois (April 2008). BSD UNIX Toolbox: 1000+ Commands for FreeBSD, OpenBSD and NetBSD (First ed.). Wiley. p. 309. ISBN 978-0-470-38725-2. Lavigne, Dru (24 May 2004). BSD Hacks (First ed.). O'Reilly Media. p. 448. ISBN 0-596-00679-9. Wikimedia Commons has media related to NetBSD.